Shoei Qwest Wanderlust Helmet The Shoei Qwest Helmet was built with a focus on minimizing helmet weight, decreasing noise and optimizing fit, comfort and protection to bring a new level of comfort to touring helmets. Featuring a slightly round oval internal shape, the Qwest is manufactured with 4 individual shell sizes to keep the helmet as low-profile as possible. The smaller the helmet shell, the lighter the helmet weight. 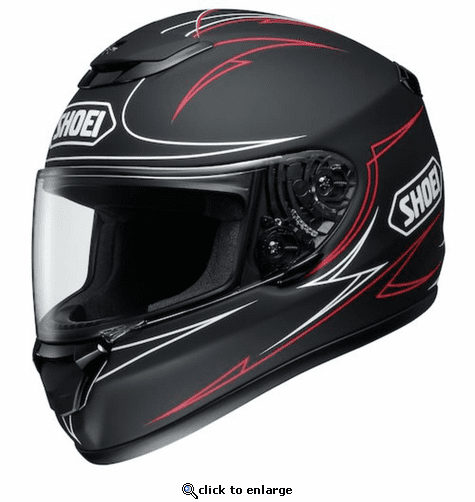 The Shoei Qwest Helmet also uses the Shoei's CW-1 visor technology with the Q.R.S.A system. This system guarantees a tight seal at the face shield by pulling the shield back to contact the opening seal evenly. The Qwest also touts an extra-wide eyeport for additional peripheral vision so you can more easily take in the world around you. Snell M2015 and DOT ratings means the Qwest is no compromise when it comes to safety.